"This over-the-top ice cream treat is fun to share with a crowd. Put toppings out buffet-style and it's time for a make-your-own-milkshake party. Serve with straws and iced tea spoons and loads of napkins." Refrigerate 2 tall glasses until chilled, at least 30 minutes. Spread marshmallow cream over graham crackers and place on a nonstick baking sheet. Broil graham crackers until marshmallow cream turns golden, about 3 minutes. Let cool. Pour chocolate milkshakes into chilled glasses. Place glasses on large plates. Top each milkshake with 2 scoops ice cream. 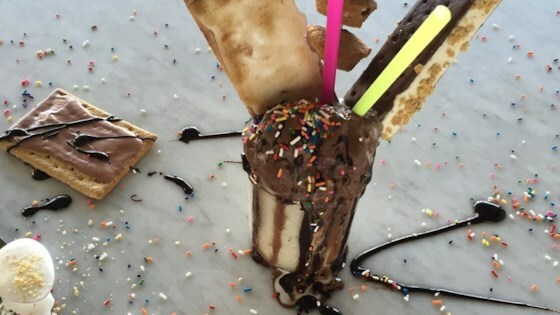 Decorate milkshakes with broiled marshmallow crackers, muffins, cookies, toaster pastries, and peanut butter cups. Drizzle chocolate syrup on top and garnish with chocolate sprinkles. I have seen magazine's talk about mega milkshakes like yours please consider making more.